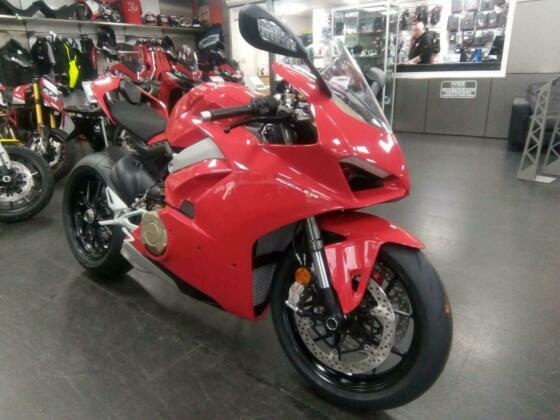 The 2018 Ducati Panigale V4 is a premium sports bike and is powered by a 1,103cc V4 engine which puts out 211bhp. The mid-range V4 S adds a lightweight Lithium battery, forged wheels and Ohlins electric suspension. Compared to the outgoing 1299 Panigale it's down in capacity by 182cc but up 6bhp in power, red lines 3,000rpm higher and weighs 8kg more. The new V4 engine is only 2.2kg heavier than the V-Twin in the 1299 but the new bike breaks ground by using the engine as part of the front frame to save weight and makes use of lighter Brembo calipers. Controlled drift while braking is a new feature of the Bosch IMU system, which is basically cornering ABS on only the front wheel. The 5-spoke 17" wheels take a Pirelli Diablo Supercorsa SP 120/70 tyre at the front and huge 200/60 at the rear. Accessories include the GPS/data logger and multimedia system. The middle of the range £23,000 V4 S is 3kg lighter wet and gets you the lighter Lithium battery, Marchesini forged wheels, Ohlins electrically adjustable suspension and Ohlins steering damper. At the top of the range the £35,000 V4 Speciale is the same weight as the V4 S but gets you the special red/white/green paint scheme, full Titanium Akrapovic racing exhaust (+15bhp), single seat and pegs, racing screen, GPS/data logger, Carbon Fibre mudguards/heel guard/swingarm cover, Alcantara seat, special grips, adjustable pegs, racing levers, racing fuel cap, machined mirror block-off plates, brake level protection and paddock cover. It's limited to 1,500 units.